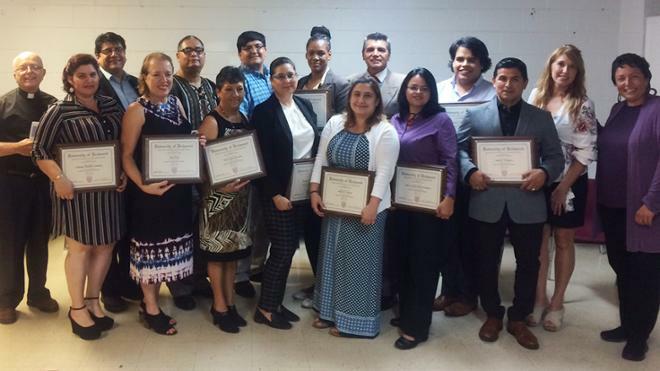 The fifth cohort of the Latino Leadership Institute — “Instituto Latino de Liderazg” — celebrated their achievements and received certificates in Latino Leadership from the University of Richmond School of Professional & Continuing Studies on October 5, 2018. Graduates successfully completed a sixty-hour bilingual program of studies. The curriculum covered leadership qualities found in the Latino culture, history and worldview, and issues facing Latino communities in the United States, Virginia and Metro-Richmond areas. Additionally, participants developed bilingual skills in speaking and writing, planning, and managing and growing a micro-business. Graduates also took away an understanding of the power and political realities of Virginia. The Latino Leadership Institute is offered through the Sacred Heart Center. Pictured are 13 graduates along with Fr. Jack Podsiadlo, S. J., Director of Leadership, Sacred Heart Center (far left); Tanya Gonzalez, Executive Director, Sacred Heart Center (far right); and Mary Catherine Raymond, Senior Program Manager, School of Professional & Continuing Studies (alongside Gonzalez).